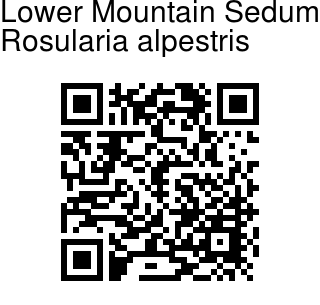 Lower Mountain Sedum is sedum found growing on lower elevations in the Himalayas. Leafy rosettes form a dense carpet. Rosette leaves are elongate-lanceshaped, 2.0-3.5 cm x 0.5 cm. Flowering leafy stems are lateral, 3.0-8.0 cm. Stem leaves are oblong or oblong-lanceshaped, long-pointed, hairless, 6-14 x 0.2-0.4 mm. Small pink to white flowers are borne in an umbel-like panicle. Flowers are 6-8 merous, small, hairless, flower-stalks 1-6 mm long. Sepals are 6-8, ovate, green, fused at the base, fleshy, hairless, pointed, 2-4.5 x 0.8-1.2 mm. Petals are 6-8 lobed, oblong-lanceshaped, pin-tipped, fused, white to light purple, membranaceous, 5-9 x 1-2.5 mm. Stamens are 12-16, in two whorls, shorter than and adnate to the petals, 3.5-5.5 mm long. Can be propagated easly by division and by seed. Can grow in full sun and also in shady sites. Well suited to rock gardens. 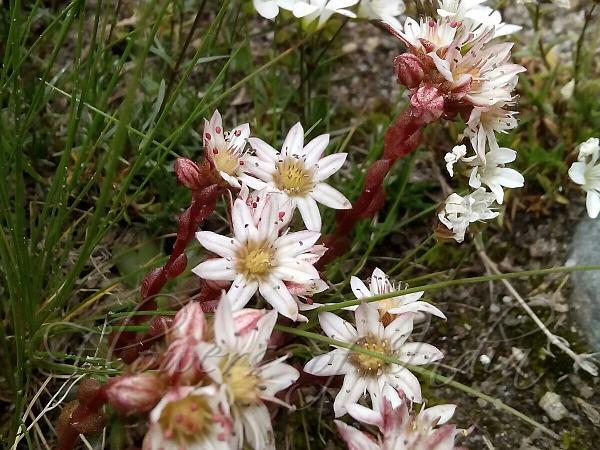 Lower Mountain Sedum is found in the Himalayas, China, Kazakstan, Kirghizstan, Uzbekistan, at altitudes of 1500-3800 m. Flowering: June-July. Identification credit: Suresh Rana Photographed in Spiti, HP & Paddar Valley, Kashmir.